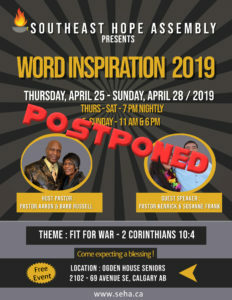 **IMPORTANT POSTPONED** – “Word Inspiration 2019” with guest speaker: Pastor Kenrick and wife Susanne Frank. Copyright © 2019 Southeast Hope Assembly. Registered Charity (BN/Registration Number: 806757852RR0001).